One of the many worthwhile benefits we offer our members is the opportunity to receive extra client enquiries. Our five client sites bring in lots and lots of them around the Country - everything from Christenings to retirements and of course all those celebrations in between too. We do have a limit on the number of DJs who can register to receive enquiries in each area, however even if your area is full, you can still join for all the other benefits we offer (plus we have a waiting list facility in operation). 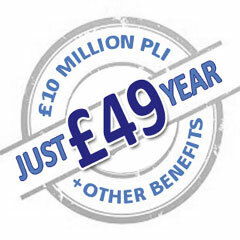 The £10m DJ PLI we provide as a benefit of membership is valid worldwide and not affected by your choice of area for client enquiries. "... I joined AMPdj for the PLI, thinking that the extra enquiries were probably just a pipe dream. I've just checked, and 4 months into my membership I have received 43 enquiries and managed to convert over 40% of these into bookings"
This was the first site we launched and it has since been given a complete makeover. It does well in the search engines and brings in a regular stream of enquiries. In 2015 it was updated to make it tablet and mobile phone friendly using a responsive design. 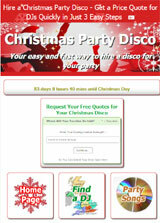 Our Party site gives clients advice and tips as well as providing enquiries for our registered members. It was completely updated and revamped in 2017 to make it mobile and touch screen friendly. This is also the site for Affiliate Members to join us. 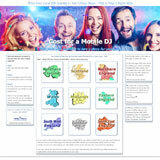 This site was added following a suggestion from AMPdj member Rob Griffiths. 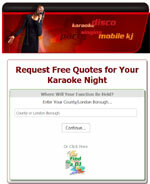 It concentrates on the specialist area of Karaoke for those who want more than 'just a disco'. This is another of our specialist sites and, although aimed at the Christmas Party market, it does receive visitors throughout the year with a notable increase from around June right through until December. Another site that has been completely updated in 2017 to make it responsive for different screen sizes. The Wedding site contains lots of useful information for anyone planning a wedding. It receives lots of visitors via social networking sites where it is often linked from.